Welcome back to the Same Page Team’s Three for 3 feature! We got the gang back together to answer three compelling questions for each conference in anticipation of the 2013-2014 NBA season. Join Daniel Reynolds, Dan Grant and Dave Game6ix Osubronie as they attempt to go Three for 3. Read their Eastern Conference preview HERE. Today, the guys talk about the Western Conference. Who is going to be the biggest first time Western Conference All-Star this season? Grant: Like Josh Smith yesterday, Stephen Curry is a player that already should have been an All-Star. A player who set a new record for three pointers last season, Curry is a sharpshooting playmaker that everyone seems to love. Unlike Smith, it’s not a consistent body of work that is the proof, it was last season’s playoff coming out party for the NBA’s newest superstar. A career 45% three point shooter, who also shoots 90% from the line, Curry deserved a spot on last season’s Western Conference All-Star team but was left off for reasons that remain inexplicable, particularly now, given that the Golden State Warriors are arguably the most fun team to watch in the NBA. The main issue seemed to be a glut of guards, with Chris Paul and Kobe Bryant locks to win the fan voting, Russell Westbrook a deserving candidate, James Harden enjoying his breakout season and Tony Parker as the co-best player on the 1st place team in the conference. With all that in mind, why not just have six guards? It’s the All-Star game! People would rather see Stephen Curry and his electric shooting than staid teammate David Lee, hyper-boring LaMarcus Aldridge (I see you Blazers fans!) and their steady mid-range games. Everything points to this being Curry’s year. Bryant and Westbrook are set to miss significant portions of the season. The christening of the Splash Brothers, the (relative) health of Andrew Bogut, the use of Harrison Barnes as a small-ball four, David Lee’s continued effectiveness on offense and the addition of Andre Iguodala have the Warriors poised to land in the top four, of a conference that is no longer as strong as it once was. Make no mistake, this is all because of Curry. If Curry misses any significant time, this team barely scrapes into the playoffs. With him? They’re in the mix for the Western Conference Finals.It seems like he’s a shoe-in. But his hopes hinge entirely on the health of his ankle, which often seems like it might have been made by this guy. Here’s hoping he can stay healthy and make the first of what should be a multitude of appearances at the mid-season classic. Osubronie: Last year, we saw Damian Lillard take the Rookie of the Year award that was Anthony Davis’ to lose. There are people who believe that Davis was injured for most of the year and thus underperformed, handing the trophy to someone from the field. The fact is Lillard deserved that award and will only continue to improve this year. To add to his short but impressive resume, Lillard will become an All-Star this year, making him the biggest first time addition to the Western Conference in February. It won’t be easy for Lillard to make the team. The numbers alone prove that injuries to other player will have to play a factor in his first selection. Bryant, Parker, Westbrook, Harden, & Paul are all likely to be chosen as finalists, but Kobe & Russell are both out with no real set date to return. If they are unavailable, Lillard should be able to capitalize on the empty roster spots. After leading all rookies in minutes last year (3,167), he has proven he is not afraid of hard work. He also led all rookies in points and assists. To cap it all off, he set the rookie record in made three pointers. With a full season behind him, an All-Star selection is the obvious next step in Lillard’s development. Reynolds: I waffled on this choice for a solid week. On the one hand, Kawhi Leonard seems like a natural to make some sort of leap into the All-Star discussion. He’ll play a huge part on one of the best teams in the conference. His athletic skills will inspire some ‘Wow’ reactions this year. His on-court demeanour, meanwhile, remains delightfully reserved at best. A player like Nicolas Batum has been running around doing similar things to Leonard and never sniffed at the All-Star game. No, the choice had to be different. With perhaps two guard spots up for grabs (do both Kobe and Westbrook make the game? ), who is to say that Ty Lawson, left to his own devices in Denver, can’t pack on a few more points and assists per game and electrify the crowd with a few of his speedy cuts to the basket? New coach Brian Shaw may be all about a more traditional, slow-it-down style (because apparently he doesn’t realize he has both Kenneth Faried and Javale McGee on his team), but Lawson is still going to be the man to make the whole operation sing. Getting on to the Western Conference All-Star team is a serious bloodsport. We’ve already talked up two other deserving guards but I vote anyway for Ty to make it. Who will make the All-Star Team? 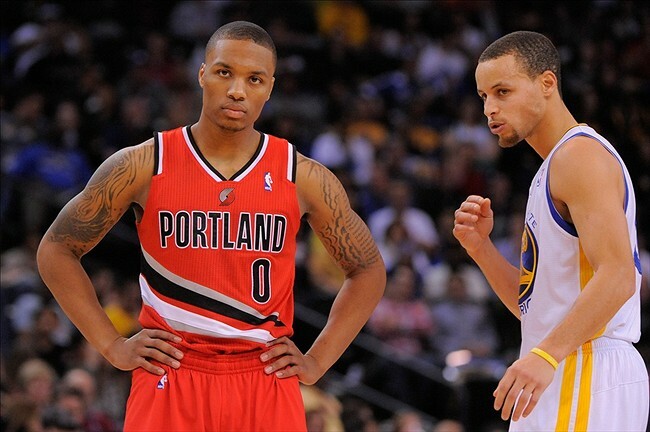 Which team has the best chance of dethroning the reigning West Conference champs? Grant: In the biggest move of a jam-packed off-season, the Houston Rockets did something no team had ever done before. They lured a major free agent away from the Los Angeles Lakers. Never in NBA history has a player been a Laker, hit free agency and decided ‘Hey, you know what? Thanks but no thanks!’ and left, despite being pursued by heartily by the Lakers. The Lakers were usually the ones grabbing the free agents, either via signings or trades, landing Kareem Abdul-Jabbar, Wilt Chamberlain, Shaquille O’Neal, Karl Malone, Gary Payton and others throughout the years. Players only left LA when they were jettisoned (Shaq), old (Malone/Payton) old and crazy (Chamberlain) or dead (Kareem). The very definition of a knucklehead, Dwight might be David Stern’s best case for demanding NBA players attend at least one year of college so that they can learn how humans function with one another in society. I’m not saying you have to go to college to do this, but it wouldn’t’ have hurt Dwight, one of the last guys to jump straight to the league from high school. After doing this to Orlando fans for over a year he then did this to Lakers fans, sort of poetic justice. Or something. What a maroon. All that said, I really think he made the right decision! The Rockets are going to be absolutely terrifying on offense, with the Harden and Howard combination giving them the best inside-outside game in the league. They have lights out shooters beyond Harden, in Chandler Parsons and Donetas Montejunas. Jeremy Lin is past the madness of Linsanity and should settle in as a decent offensive point guard, in the mold of a Jose Calderon. Omer Asik, who played really well for the resurgent Rockets last season, will likely be traded, though coach Kevin McHale has said he will try and play Howard and Asik together. That would be an abomination in terms of free throw percentage and spacing, and neither of those players would be happy sitting in the fourth quarter, so it’s likely Asik will be moved. One suggested trade had Asik heading to New Orleans for sniper Ryan Anderson, a move that makes a ton of sense, given that Anderson played with Howard in Orlando (hopefully no hard feelings?) and would space the floor much more effectively for the Rockets. With the Nuggets missing their two best players from last season, the Grizzlies adjusting to a new coach and seemingly unimproved, the Rockets are a team I could see ending up in the Western Conference Finals and potentially meeting the Heat in the Finals. You don’t think Miami realizes it’ll have to get through Chicago/Indiana in the East and maybe Houston in the West? I think that’s the very reason they’ve taken a flyer on Greg Oden. Houston is going to be excellent and fun to watch to boot. Osubronie: The West has been top heavy for a few years now. In Los Angeles, with the Lakers being the more popular, more accomplished team, it’s been difficult for the L.A. Clippers to get the respect they deserve. They definitely get a fair share of nightly highlight reels. With a new coach at the helm and the best point guard in the league running the offense, the Clippers are ready to take down the defending Western Conference champs. The Clippers main problem is focused around Blake Griffin and DeAndre Jordan. While these two players are physically intimidating, they have not found a way to raise their games to the next level. Enter the Doc Rivers Era. Who better to teach these two how to score, rebound and play defense than a championship caliber coach who spent the last four years with Kevin Garnett. His defensive mentality is exactly what Blake Griffin and DeAndre Jordan need to take this team to the NBA Finals. Jamal Crawford, Darren Collison, J.J. Reddick, Jared Dudley and Matt Barnes are the supporting cast, solidifying a spot in the playoffs. If Doc can get his team to develop a “ubuntu-like” philosophy he had in Boston, then we will see new conference champions in April. Reynolds: Let’s do the math here: The Spurs are #1. They made no major additions or subtractions (we’ll call dropping Gary Neal for Marco Belinelli a wash) and are just about as good this year as they were last year. They’re one year older, sure, but that’s no reason to believe the Spurs won’t be one of the teams in the Finals again. Except: I think the Golden State Warriors may have their number. I think the Clippers are a civil war waiting to happen, while Houston has mutiny potential. The Warriors are all good vibes and positive feelings. They can trot out a small ball lineup of Curry-Thompson-Iguodala-Barnes-Lee or go big and throw the recently resigned Andrew Bogut into the mix. It is easy to forget now, perhaps, that we all believed that the Warriors could beat the Spurs (after pushing their conference semifinal series to 2-2). I know the advanced stats suggest that the Warriors’ point differential could use some work (translation: must improve defense; enter Iguodala). But honestly, math, numbers, they don’t apply. Not when Curry is draining every shot he takes, when Barnes is playing like a wizened vet, when Bogut is being everybody’s favourite teammate, when Iguodala and Thompson are strafing along both sides of the court, and when coach Mark Jackson is preaching from the side lines (plus Kent Bazemore!). In this case, faith wins and everyone can believe. 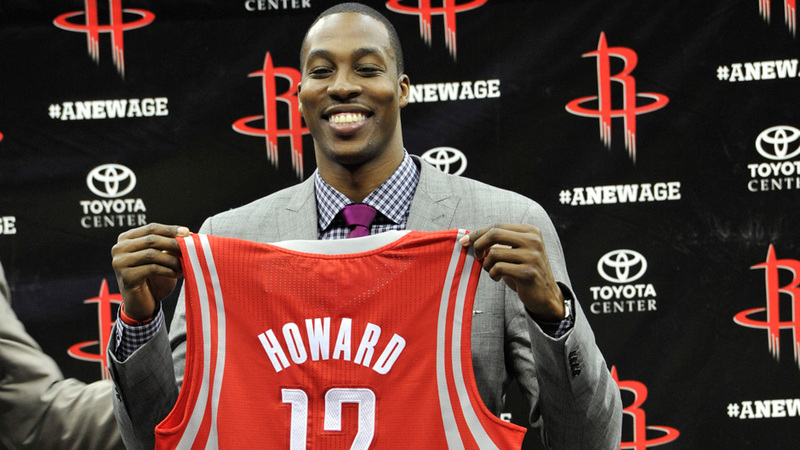 Will D12 make the difference for Houston? .Which team are you rooting for to do well this year? And why? Grant: During an NBA preview last week, Jalen Rose predicted that when his current contract expires, Kevin Durant is going to pack his bags and head south to Houston to play with his friend James Harden and Dwight Howard, forming the newest three-headed NBA monster. As Houston has no state tax, and Durant attended college there, all the pieces seem to fit. The Harden trade has left a black mark on what was one of the NBA’s best small market stories. Despite being stolen from Seattle, the Thunder franchise was a model for how to build through the draft in the NBA. GM Sam Presti confounded other executives for a four year span, landing Kevin Durant, flipping an aging Ray Allen to Boston for a pick that became Jeff Green (since traded for Kendrick Perkins – maybe we should have seen this coming), drafting Russell Westbrook well ahead of his projected number and then drafting James Harden to top things off. Harden was originally seen as something of an early ‘bust’ as Steph Curry and Brandon Jennings were taken later than him and had sensational rookie seasons. Now? Harden might be the best offensive guard in the entire NBA. The problem is that he’s no longer in OKC. Last off-season, with a max contract for Harden looming and Kendrick Perkins apparently holding his family hostage (cue the population of Oklahoma City screaming: USE YOUR AMNESTY PRESTI! ), Presti preemptively dealt Harden to Houston, landing scorer Kevin Martin, recent lottery pick Jeremy Lamb and two first round picks in exchange for the dynamic guard and some spare parts, all of whom have been waived by the Rockets. Right now, it looks like one of the worst trades in NBA history and is looking worse all the time. Kevin Martin left OKC in free agency already. Westbrook is out with a devastating knee injury. Nothing is breaking right for the Thunder. This is why I’m rooting for them. I want Jeremy Lamb to contribute for this team. I want rookie Steven Adams (the first of those first round picks acquired in the trade) to give them energy off the bench. I want Perry Jones III to shake the ‘lazy’ knock against him and use his incredible talent. I want whoever they use that second first round pick on to work out. I don’t want the legacy of OKC to be that they gave away one of the league’s top five players, which cost them the league’s 2nd best player in Durant, which then cost them one of the league’s 15 best players in Russell Westbrook. That was the other part of Rose’s prediction – that Westbrook would leave OKC to join college team-mate Kevin Love in Los Angeles, where they went to UCLA together. The scary part? That makes even more sense than Durant going to Houston. I don’t want to see that. I want Durant and Westbrook to be Michael and Scottie, Magic and Worthy, Isaiah and Dumars, teammates for life. I want an NBA where the little guy can survive. I thought OKC was going to be the next San Antonio. Hopefully they’re not just a cautionary tale. Osubronie: The Minnesota Timberwolves just have horrible luck. When Ricky Rubio returned from his ACL injury there was hope he would finally be reunited with Kevin Love for a whole season. Then Kevin broke his hand. Then he broke it again. With only a few days to the start of the season for the Timberwolves, fans can only hope that nothing goes wrong. I think that for the first time nothing will get in the way of seeing these two superstars co-existing on the court. For that reason, I’m rooting for the Timberwolves in 2013-14. I mean with all that has happened to them. How could you not? When Love or Rubio is on the court, Minnesota already has one of the most exciting teams in the league. Both of them together, however, has the potential to be one of the most exciting teams EVER! Rubio’s passing ability and Kevin Love’s basketball IQ are a match made in heaven. Providing there are no more injuries, the pair has two more years to dazzle fans before Love and his UCLA roommate Russell Westbrook leaves for L.A (not-so-bold prediction). This has to be the year where luck is in their favour. So I’m rooting for you Minnesota. That two year clock is ticking. Reynolds: I think the sun is setting on the grit and grind era of the Grizzlies. I don’t like typing that out, I swear. They were supposed to implode a little while back, you remember that? They traded their presumed “best player” in Rudy Gay and somehow got even stronger. Hell, they were supposed to be terrible after trading Pau Gasol and signing the keeling titan known as Z-Bo. Building a team around shaky Mike Conley, delusional Tony Allen and chubby Marc Gasol was not supposed to work. Somehow it did, for a time. Ah, for just a few glorious years. This year Memphis appears to be moving further and further away from their Graceland. Mike Conley has blossomed into a quality starting point guard, true. Marc Gasol remains beloved (for now and, really, for all time). But, Zach Randolph, the legend of Z-Bo? He is listing into the sea of old age, no longer able to bull his way to the rim like he used to. The small forward position? Relying on the phantom of Tayshaun Prince and the echo of Mike Miller. Are you betting on a team that rebuilds its playoff offence on the fly around a guy named Quincy Pondexter? No. Still, the Grizzlies are just so damned crazy; they have a mascot but also a spirit. Their name makes no sense and it makes all the sense in the world. I want the Memphis Grizzlies to do well, even though I suspect their claws are going dull. Keep grinding out there Tony Allen, keep grinding. 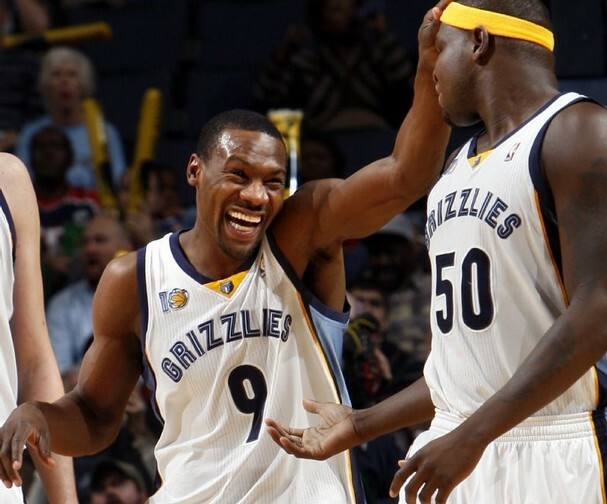 Tony Allen: The NBA’s spirit animal.